"During my diploma I had the opportunity to do placements in different high-end hotels, which gave me a clear idea of what I wanted to do as a career, and I knew that the degree would increase the skills and knowledge I had already gained,” she says. Although moving to London was a personal challenge at first, Barbara says it soon provided proof of what she was capable of. 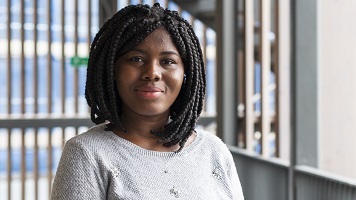 Currently working as an occasional tour host for Arsenal Football Club where she sells tickets to visitors, assists them during their visit around the stadium and museum, Barbara is also employed as a Student Ambassador for LSBU where she represents the University at events. “What I like about my job is that it gives me the opportunity to be in the midst of people all the time, interact with them and make use of my knowledge of the two modern languages I am fluent in. With both her degree and current roles helping Barbara to build on her skills and knowledge, she is certain that her future will involve doing what she loves the most.